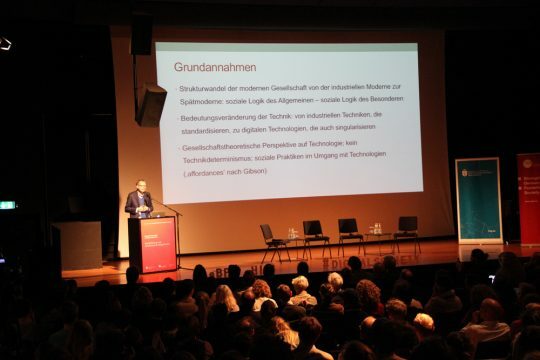 According to Andreas Reckwitz, we are living in a time of fundamental social change — our society is becoming a society of singularisation. Digitisation is playing a pivotal role in this process. But what exactly does singularisation mean? And what consequences will it have for the constitution of our society? Marc Pirogan takes a look back at his lecture. 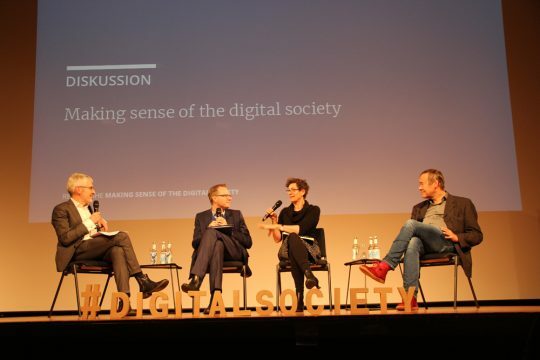 At the closing event of the lecture series Making Sense of the Digital Society for 2018, Andreas Reckwitz gave a lecture on the society of singularisation and its connection to digitisation. 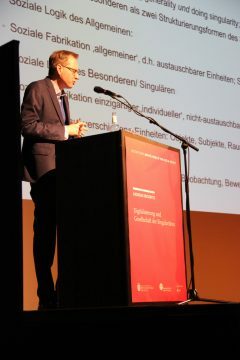 At the beginning of his lecture, Reckwitz noted he adopts a societal theory perspective that depicts a historical change in which digitisation is only one of several relevant factors. This should in no way represent a kind of technological determinism. Technology offers affordances that have a pre-forming effect, but also opens up different possibilities. According to Reckwitz, modern society, beginning from 1800 onwards, is characterised by a double structure. On the one hand, it promotes a logic of the general and standardisable. Following this logic, people, places and things are aligned according to general standards, think of the assembly line or role attributions in the public sphere. At the same time, a counter-trend, the promise of the special and unique – singularisation – has always been inherent to modernity. This counter-trend was evident early on, with romanticism. Whereas at the time a romantic concept of individuality was prevalent, today, objects, places, events, and communities are also presented as something special, “singular”. 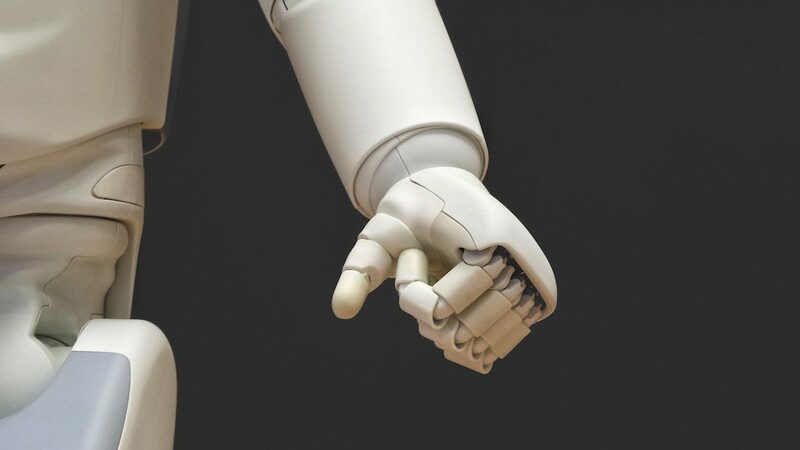 With the transition from industrial modernity to late modernity in the past 30 to 40 years, the significance of singularisation has gained enormous importance. It has been transformed from a niche and elite phenomenon to a mass phenomenon. The logic of the general continues to be present, for example, as a technical infrastructure, but has lost its relevance. Examples of singularisation can be found in our lifestyles and diets, our consumption habits in general, or traveling to “special” and “unique” places. According to Reckwitz, the causes of singularisation can be found in the interplay of three intertwined factors. First, there has been a cultural change in values that has brought self-realisation and authenticity to the fore. Second, industrial capitalism and its standardised products have reached limits of economic saturation. Singularisation here works by creating new markets. And third, the technological factor in the form of the digital revolution was also decisive. While previous technologies had a standardising effect, digital technology now promotes an orientation towards “the special”. In the case of individuals, this happens on a cultural level and on a machine level. At the cultural level, they present themselves in the attention economy of social media. At the machine level, individuals are furthermore observed automatically through data tracking and algorithms. While the cultural process is visible to everyone, the machine process takes place behind our backs. What is decisive is the form of the profile. On the profile, individuals present their uniqueness and visually depict their subjective experience. The uniqueness of the individual is also captured in the data-based tracking profiles. But it is not only individuals who are singularised in the digital realm; so, too, are objects. The web is increasingly being personalised, for instance, in Google’s search or Facebook’s feed. Digital tools enable users to put objects such as images or texts online. Furthermore, collectives increasingly present themselves as singular. 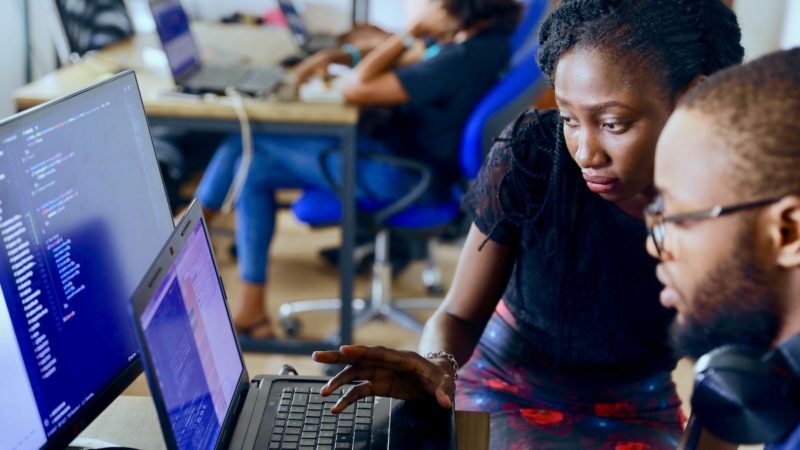 Communication communities are emerging around specific topics, ranging from unusual hobbies to political communities, which are relatively self-contained and commonly referred to as “filter bubbles”. 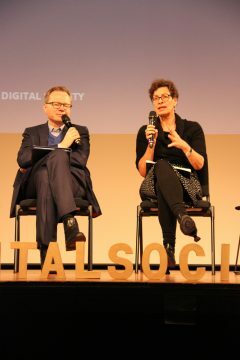 These digital neo-communities are singular entities that regard themselves as unique and offer their members a sense of collective identity. Interested in the lecture series? Find more articles in our dossier! 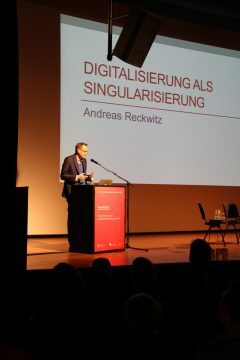 Reckwitz mentioned various developments as consequences of digital singularisation. 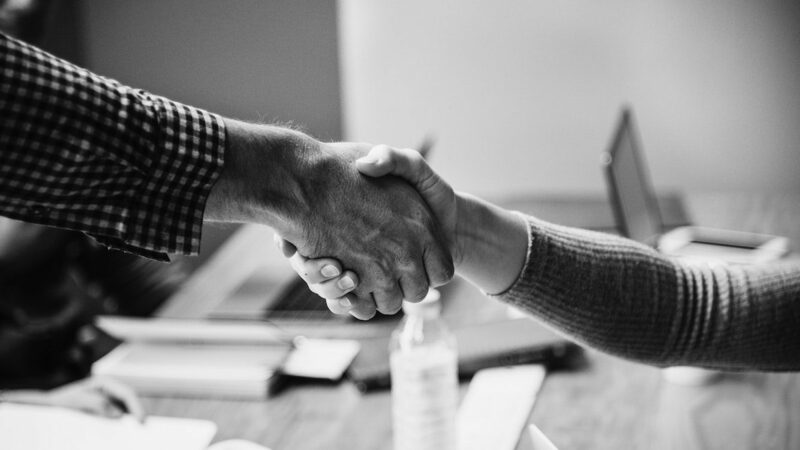 In the competition for visibility and attention, individuals have to distinguish themselves increasingly. Those who do not stage themselves skillfully risk being disadvantaged. Furthermore, Reckwitz observes an erosion of the public sphere, while it is fragmenting into separate communication communities. 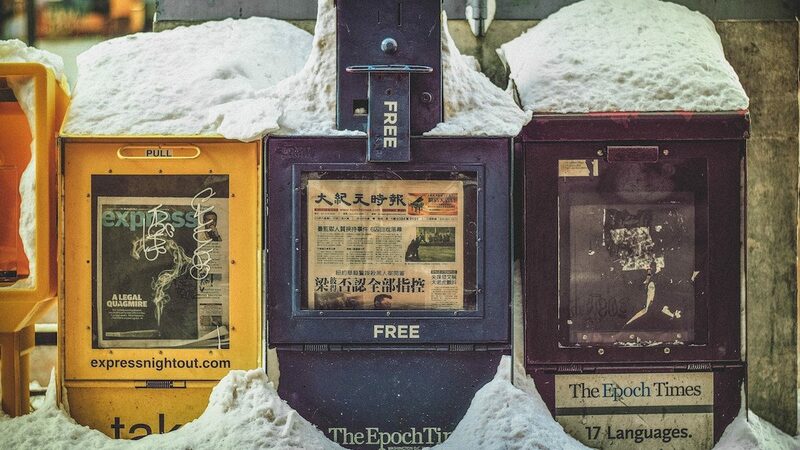 Moreover, personalised news composition deprives the general public of a common information basis. Reckwitz depicted the culture of the Internet as characterised by a strong emphasis on the present and on novelty. Accordingly, attention and the ability to look at complex interrelationships is diminishing. Furthermore, we can observe an affect culture in the digital realm. Singularisation is necessarily associated with emotions and affect, since uniqueness is typically fascinating. The general, on the other hand, is instead characterised by dispassion. But this affect culture of the internet not only evokes positive affect and emotions; deterrent and repulsive phenomena also attract attention. 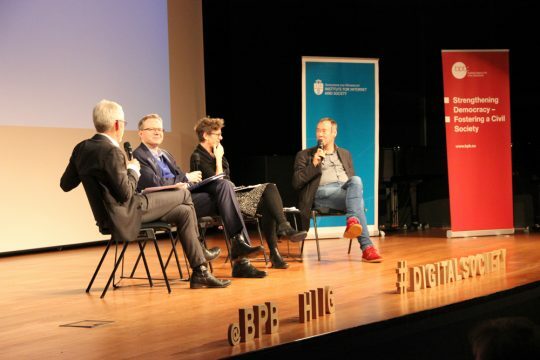 Following the lecture, Jeanette Hofmann, director of the HIIG, and Thomas Krüger, president of the bpb, joined the moderator Tobi Müller and Andreas Reckwitz on the stage for a discussion. At first, Reckwitz was asked to precisely define the relationship between singularisation and romanticism, and to determine the general relationship between the phenomenon and the development of the artistic field. According to Reckwitz, society was sensitised to the uniqueness of people, nature or works of art as a result of romanticism. With the beginning of modernity, the artistic field began to differentiate itself as well. Instead of following rules and perfecting them, the modern artistic field is about originality, the breaking of rules. While the romantics insisted on uniqueness, the artistic field has been characterised by an audience that determines uniqueness. So the social judgement is the relevant factor for the existence of singularity, just like it is now in the age of digitisation. In the artistic field, however, only a few producers have a large audience. 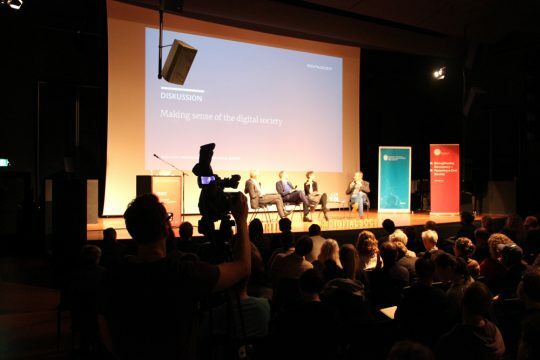 Digitisation is now dissolving this barrier, producers and audiences become mutually interchangeable. In response to Jeanette Hofmann’s question as to whether singularisation is an elite phenomenon – think of fashion, for example – Reckwitz replied that this is by no means the case. The internet and social media are mass phenomena. The emphasis on singularity can be seen not only in the stars of pre-internet media, but also in YouTubers, even when they are still unknown. How can we counteract the trend towards singularisation? 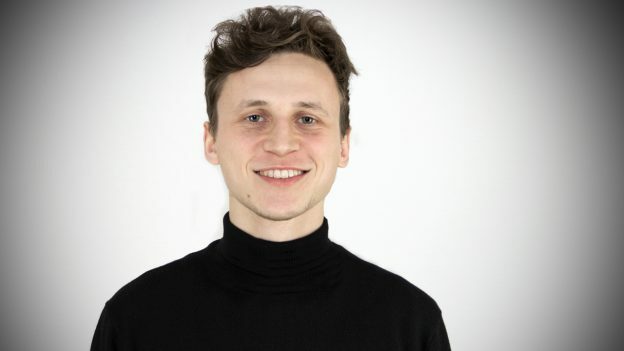 Thomas Krüger took up the point of increasing affectivity, which he himself experiences in his political work. He observes a split between advocates of a liberal, open society and a reflex towards closed, sometimes even homogeneous communities. This development cannot be incorporated into a classic left-right paradigm, because leftist ideas such as cooperatives or “commons” can also be assigned to closed communities. However, the tendency in the debate to neglect the economy and to culturalise everything is dangerous. This critique can also be applied to Reckwitz’s depiction of singularisation. 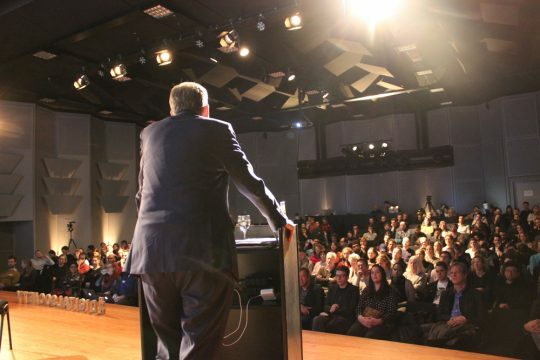 Reckwitz agreed that the public debate should go beyond discussing a cultural change. The economy should be considered as well. It is impossible to understand the social shift towards singularisation without an understanding of the limits of capitalist saturation at the end of industrial modernity. 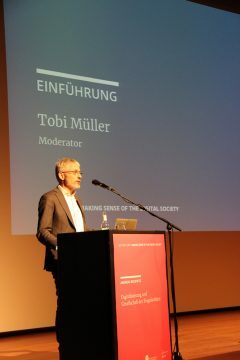 Finally, Tobi Müller asked the panelists to discuss the political and civic societal scope for intervention in order to minimise negative effects of singularisation. Reckwitz opted not to, because as a social scientist he believes he should hold back from making predictions, because they usually fail. Thomas Krüger stressed that institutions themselves should question their practices. In civic and political education, for example, we can no longer take for granted that individuals will express their arguments in a rational way. The factors affectivity and emotionality have to be taken more into account. 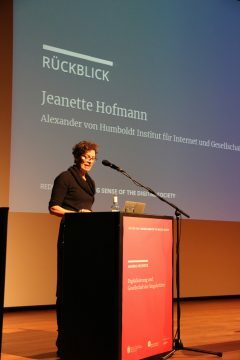 Jeanette Hofmann highlighted the problem of opaque algorithms. Civic society and political pressure are already demanding accountability from social networks, she argued, but this should be done even more vehemently. Andreas Reckwitz is Professor of Comparative Cultural Sociology at the European University Viadrina. His works are large-scale sociological studies on social tendencies such as subjectivation, aestheticisation or singularisation. His most recently published books are The Invention of Creativity (Polity Press 2017) and Ästhetik und Gesellschaft (Suhrkamp 2015). In 2019, the English translation of The Society of Singularities will be published by Polity Press. From April to July 2019 Reckwitz will be Thomas Mann Fellow at the Thomas Mann House in Los Angeles.